Vanessa helps us out on Thursday evenings and Saturdays. She is a former optician and has many years of experience in the optical industry. Vanessa lives in Mechanicsburg with her husband, Steve and their four fur-babies Symon, Quincy, Stella and Sophie. When she’s not busy working her full-time job and filling in for us, Vanessa enjoys entertaining friends, riding her motorcycle and taking trips in her RV. "Great products and great service! If you are not sure which frame style fits you face shape, Jen is your girl. 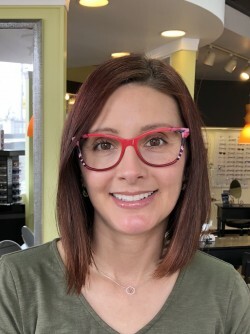 She has an eye (pun intended) for fashion and is extremely helpful in helping to choose the perfect frame and color that compliments your face shape and skin tone." By now, you've probably heard the buzz about harmful blue light and ways to block it. But what exactly is blue light and how damaging is it to our eyes? Established in 1996, Hampden Optical has been providing Central Pennsylvania with exceptional service and the latest trends in the optical industry for over 20 years.